Yesterday I was home, and feeling energized from working out on Monday, I decided to get a few things done. First, I mopped all the hardwood floors. All the floors in this house are hardwood which is the best thing because I have bad allergies. Besides, it's simplicity for decorating at it's best...strategically place a few throw rugs and voila...done! After I mopped, I decided to make baked macaroni and cheese. I think it was because I'd seen two of my fellow bloggers do that recently and now I was craving the stuff. So a nice 9" x 13" pan of that finished baking about 10:45am and my first bowl was consumed before 11:00am! I needed the additional carbs because next on my agenda was to walk the mountain with Moon and Copper. They had their noses to the ground for such a long time, it was amazing! I don't know what they were tracking because I didn't see any paw prints. And speaking of tracking, I'm trying to track the number of times I walk this year. I find it helps me stay focused, clears my mind and opens my heart. It puts me in such good spirits being one with the elements. I'm glad I'm not a city girl. After we got back to the house, I decided to work around the yard picking up dead branches that have fallen over the winter months. Moon and Copper supervised. They watched every move I made, waiting patiently down near the shed while I made the brush piles bigger and bigger. I looked up and there it was! A perfect tool provided by Mother Nature herself. A perfectly shaped ice pick that worked like a charm! 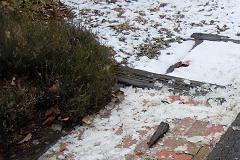 I chipped away the entire walkway! 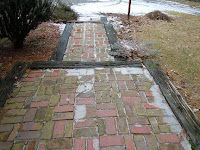 Now, when the rain comes, it can drain freely between the bricks, assuming the ground thaws! Oh, don't worry! I got those chunks before I went in! Now when you come to visit, you won't slip and fall like I did! I love your pathway,I am redoing mine now! Take care on the ice! My you sure had an energy burst. Hope you enjoyed the mac & cheese. awesome walkway JP...worth all the hard work to let it out from under all the snow & ice, eh?! I love to walk, but the weather here has been so cold and dreary lately that I've gotten quite lazy about it. It's easy to tell a difference too - a little weight gain, a tiny bit of winter doldrums..... More than ready for spring! Wow, JP, what a busy day for you! I can't wait until this weather breaks here -- it's actually not safe to walk right now. The wind chills are deadly. Hope you didn't hurt youself in the fall. Ouch! What vitamins are you on? I need some! I love that path. I want to do a path out to the drive way to guide people to the correct entrance....not by back porch/mud/junk room. Sounds like you had a good, productive day. I have the best mac and cheese recipe ever if you have a crockpot. Let me know - it's very easy. You were productive yesterday! I was LAZY. MMMM! Mac and cheese - my very favorite. I take it the big winter storm has passed you by. We are on the northern edge of it. Snow and drifting, but not bad. The birds and squirrels are keeping the feeder very busy today. Doesn't it feel good to get stuff done outside even when the weather is cold. I got limbs picked up out of the lane this morning only because I had to to get out. Too windy and cold today to do anything else. Be careful out there. Okay - you are a working gal! You are amazing - I got tired from just reading it. Hope you are okay with the fall. Hey did you get any snow on this last round? mmmmm...mac a cheese...sounds wonderful. At this rate every blogger in the country will be making mac & cheese.